Mortal Kombat vs. Street Fighter. The battle for fighting game supremacy has clearly died down over the years, and I'd say it's a fair observation that Street Fighter came out on top, but that hasn't stopped Midway (now Warner Bros. Games) from trying its best to keep its own flagship fighter relevant. After a rough period that included the release of several abysmal spin-offs and an underwhelming (but also underrated) Dreamcast port of MK4, it seemed the franchise was on the verge of becoming extinct. That is, until Mortal Kombat: Deadly Alliance was released for the PlayStation 2, Xbox, and GameCube. Series creator Ed Boon and his team brought Mortal Kombat into the modern age with a new 3D engine and a return to the darker feel of the series' earlier games. Some fans still criticized the series for moving into 3D, and fighting game afficianados looked down at the game's pre-patterned combo system, but overall Deadly Alliance breathed new life into Mortal Kombat, and the formula was improved for its sequel, Deception. Rounding out the series was Armageddon, a behemoth of a fighting game featuring every character in MK history in playable form, including bosses. By this time, the engine was beginning to show signs of aging and Armageddon wasn't as well received as its predecessors. Boon and company decided to take a different approach. Just like the old days, Mortal Kombat did something similar, but decidedly different than Street Fighter with the release of Mortal Kombat vs. DC Universe, pitting well-known characters from the fighting game franchise against legendary DC Comics superheroes. However, the toned-down violence didn't sit well with longtime fans. Midway eventually filed for bankruptcy and was taken over by Warner Bros. Ed Boon opened his new development studio, Netherrealm Studios, under the WB umbrella, and began working on a game that would bring MK back to its roots, pleasing fans, and showing that his game could go toe-to-toe with the best of the genre. The new Mortal Kombat, which features no subtitle or number, is both a continuation of the previous games and a reboot. The game's story suggests that Shao Kahn won the battle for both Outworld and Earth Realm at the end of Armageddon, becoming the undisputed master of both. The thunder god, Raiden, mystically sends a message to his past self, showing him the events that will unfold, thus giving him the knowledge to change the future - and beginning the tournament anew. Featuring a cast of 26 fighters spanning the first three games in the series, Mortal Kombat is the rebirth of a classic franchise and utmost fan service. After numerous delays to the retail product, Sega quietly sneaked a demo of their upcoming Virtua Fighter 5 onto Xbox Live this past Friday. As an avid VF fan since the first game in the series, I've been excited about the 360 port since it was announced. At one point, I even considered buying a PlayStation 3 solely for VF5, before it had been announced for Microsoft's console. Thankfully, insufficient funds kept me from doing so, because the Xbox 360 port of the game looks to be superior in every way. The biggest addition is obviously the inclusion of online play; a first for the series. Unfortunately, the demo does not allow for any online play, but it does contain both of the new fighters that were added to this fifth game, Eileen, who practices monkey kung-fu, and El Blaze, the Mexican wrestler who practices lucha libre. Two old favorites, Akira and Sarah Bryant, are also present for your pummeling pleasure. You can play arcade mode, where you'll fight El Blaze, Lei Fei, and Jeffry McWild, or versus mode if you happen to have a buddy around. One of the things that always attracted me to the VF series is the way every fighter is so drastically different. Unlike most fighting games where players have 2 or more characters they are exceptionally good with, Virtua Fighter tends to force you to pick one character and stick with them. Each character fights in a real life martial arts style. There are no fireballs or dragon punches here. I've been playing as Kage-Maru ever since the first game and I know his moves fairly well, but after trying out El Blaze, I may just have to switch. 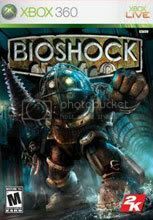 Irrational Games, now known as the far less interesting moniker 2K Boston and 2K Australia, has some pretty big shoes to fill - namely their own. Their classic PC horror RPG/Shooter hybrid System Shock 2 is considered by many to be one of the greatest games of all time. Anyone I've talked to about video games in the last year knows how excited I am for BioShock, the spiritual successor to the System Shock series. My excitement was nearly matched by my trepidation, however, that the game could not possibly live up the the hype, not to mention my lofty expectations. After spending some time playing the demo that popped up on Xbox Live over the weekend, my fears have officially been put to rest.